Peeling Pulp, Doing Chores, Riding Bikes. “A Message For You” – Chapter 13 – by Vital Thebeau. That winter we didn’t have any school, because there was no teacher. My brother Camille and I thought we should start cutting pulp. Camille was 12 years and I was 15 years old so we cut pulp through the winter. We had to make sure to feed the animals, milk the cows and after we had that done we would go to the woods to work. We cut pulp for 2- 3 hours, we go for lunch and after lunch we would go back to the woods again. We would work for 2-3 hours then go back home so we could milk the cows. We did that most of the winter. 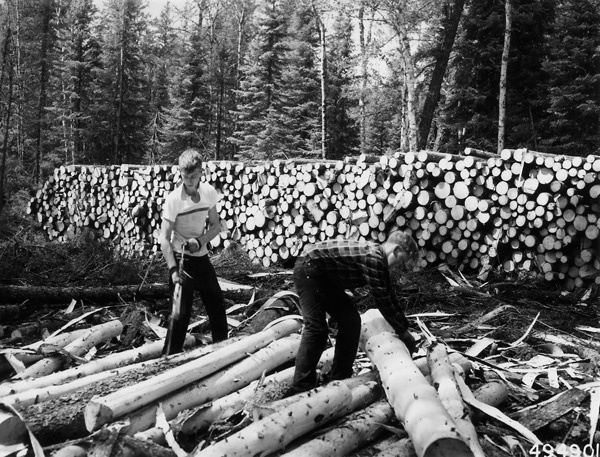 We had about 40 or 50 cords of wood cut, and then we had to haul the pulp through the woods. We did that with a horse and bobsled. We could only haul about a cord or better a day and that took a while. When we had the pulp out we had to take the bark off the pulp. We had to do that with a draw-knife. We did one cord a day or more sometimes. We were done in the middle of May. We ordered our 2 wizard bicycles. 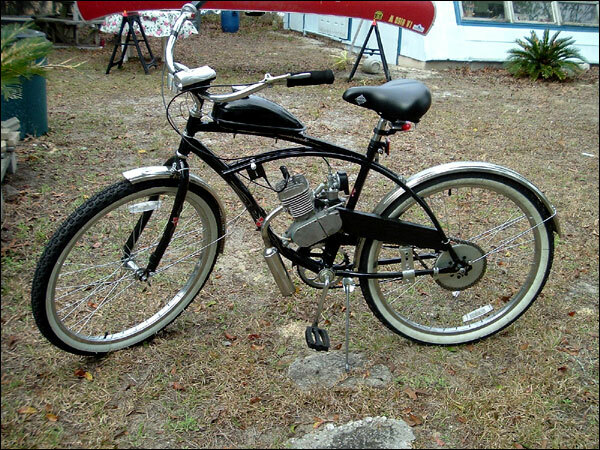 The motor was inside the frame, and the bicycle tires were almost twice as big than the regular bicycles. Five months later the bicycle wasn’t that great because the motor wasn’t all that good. The inserted connecting rod was no good because they were too soft. So my dad made some for us. When he made them he made quite a few, maybe a dozen or so, because we had to change them quite often. It would take about half an hour to put new ones in, and then we would be ready to go again. He made a mold, he used barbette (some kind of a lead) and zinc, and he melted the zinc and barbette together so it would make it a bit harder so they would last longer. They worked pretty well and were lasting quite a bit longer. That made us very happy. This is what we were using to go see the girls and sometimes we would give them a drive on the bicycle .They had to sit on the crossbar that was not to comfortable but it was better than walking. The girls would like to go on the bicycle at night. It wasn’t too impressive, but at that time we did not have a car. It was the next best thing so we were happy boys. We were the only ones that had bicycles like that. This button at the bottom of the page makes it easy to buy my book, and if you do buy one, I thank you for helping my dream come true. If you would like an autographed copy, let me know!